Good looks and efficiency are the features that make gas fires a popular choice among users. Gas fires with glass front doors often have efficiency rates in excess of 80% making them extremely effective at warming a home. If you wish to enjoy heat at the press of a button then, a gas stove is the perfect choice. At LeedsStoveCentre, we stock an extensive collection of gas stoves from leading brands like Gazco stoves, Yeoman stoves and Dovre stoves. Our range of gas stoves is a combination of beauty, quality finish and high-performance. Many of our gas stoves have an input below 7KW eliminating the need for a fixed ventilation. This means you can install your new stove wherever you want. 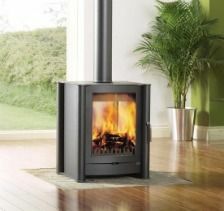 Leeds Stove Centre offers an extensive range of gas fires. From traditional to contemporary gas fires, we have extended our range incorporating the latest log effects and flue types. The contemporary gas fires look superb in modern home decor that would suit any home and any taste. Gas fires come with a selection of frames and fronts to ensure your fire fits your interior decor. Some of our gas stoves come with dual benefits enabling you to convert your gas stove to run off LPG helping you to save your fuel bills. Leeds Stove Centre employs a team of highly experienced installers who are Gas Safe Registered and HETAS approved to carry out installation jobs. So, give your home a beautiful cosy feel with our exclusive range of gas stoves.